I have attached a file from the HowDoISample-ForiOS project from GitHub. The file has been modified to show the crash that I am running into. Using OpenStreetLayer and a custom zoom level set for the MapView I am crashing when I zoom to somewhere around level 18+. This was tested on a IPAD. In this case my initial extents cover the state of texas, and my zoom level set is based off those extents where level 1 encompasses that area. Android using the same code displays Empty tiles with the crossed out camera icon on it which is what I would expect for iOS as well. Our developer build a sample based on your code, it looks we cannot reproduce your issue by the latest version package. We suggest you upgrade your package to the latest version, because maybe the problem had been solved when version upgrade. Here is our test sample, please try it and modify it to reproduce your problem if possible. attached file has modified coordinates and scale for another data set that we are using. New York City area. Extents that are set are for zoom level 20 and should cause a failure on initial display. Device we see the failure on is an IPAD 2, and an IPAD 4 and built with visual Studio 2015. Thanks for your sample, we will find another device tomorrow and test it follow your setting. We tested the modified code follow your setting and test it in both Ipad and Simulator of VS, they works well. The only different is our VS version is 2017, but I don't think it's the reason. Could you please watch the debug window to see any information is print, if you found anything please let us know. And we want to make sure your IOS detail version, we think you should want to run the application in Simulator so some debug information is helpful. Here is the entire contents of the debug output log when going to the device. The app has been terminated. I build an IPA to test the sample on other ipads all running v10.3.x of iOS. Initial display on all 3 worked first time. Unfortunately only one of the 3 people doing the testing went further and he ran into the crash issue while zooming in/out. So at best this is happening sporadically -- except on the table that I am using where it occurs all the time. As for the simulator -- I cannot get that to work with reverting to an earlier VS release. Thanks for your information, our developer research your problem and here is the response about it. The sample works well with SDK version 12.1 and iOS 10.0. We recommend you to upgrade iOS version to at least v10.0, the iOS 9.0 had stopped to be supported. 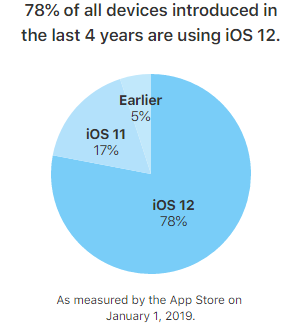 In fact our map keep follow the newest upgrade of Microsoft Xamarin.iOS and Apple iOS, you can see iOS 11 & 12 are used on about 95% devices now (https://developer.apple.com/support/app-store/), we will also stop to support older version in future follow the change. You can try to use VS2015 and iOS 10.0 to build and run your sample to see whether it works. If the sample still doesn't work, you should want to upgrade to VS2017, the reason is the Xamarin.iOS of VS2017 was used to build our ThinkGeo.MapSuite.iOS, we cannot ensure the assembly is supported well and works normally before VS2017.